Satire takes as its subject the absurdity of human beings, their societies, and the institutions they create. For centuries, satirists themselves, scholars, critics, and psychologists have speculated about the satirist's reasons for writing, temperament, and place in society. The conclusions they have reached are sometimes contradictory, sometimes complementary, sometimes outlandish. In this volume, Leonard Feinberg brings together the major theories about the satirist, to provide in one book a summary of the problems that specialists have examined intensively in numerous books and articles. In part 1, Feinberg examines the major theories about the motivation of the satirist, and then proposes that "adjustment" comes most closely to answering this question. In his view, the satirist resolves his ambivalent relation to society through a playfully critical distortion of the familiar. The personality of the satirist, the apparently paradoxical elements of his nature, the problem of why so many great humorists are sad men, and the contributions of psychoanalysts are explored in part 2, where Feinberg contends that the satirist is not as abnormal as he has sometimes been made to seem, and that if he is a neurotic he shares traits of emotional or social alienation with many others. Part 3 explores the beliefs of satirists and their relation to the environment within which they function, particularly in the contexts of politics, religion, and philosophy. Feinberg stresses the ubiquity of the satirist and suggests that there are a great many people with satiric temperaments who fail to attain literary expression. 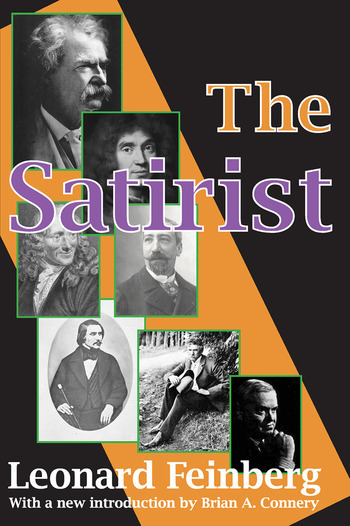 Ranging with astonishing breadth, both historical and geographical, The Satirist serves as both an introduction to the subject and an essential volume for scholars. Brian A. Connery's introduction provides an overview of Feinberg's career and situates the volume in the intellectual currents in which it was written.